Diary of A Rural Manager ! I have been working in development sector for six years, longer if you include student life in my alma mater’s rural management program. So would you believe that I have never, not once, have a meeting with an ecologist? I had only attended a small talk by Mr. Pankaj Sekhsaria in early monsoon of 2011. I accompanied office colleagues to a meeting at the Aravalli Biodiversity Park. We met Mr. M. Shah Hussain, Scientist In-charge and Ms. Aisha Sultana, Field Biologist. It was worthwhile experience to understand the technical process that went into setting up the whole park. The ecological conservation and restoration started in 2004 and 450 acres (total area 700 acres) have been completed by now. The whole area was Acacia dominated forest with mesquite (Vilayti Babool trees) as a dominant species. The team of ecologists replaced mesquite with forest communities present on Aravali range in Haryana, Rajasthan and Gujarat. Their efforts has converted open mining pits into micro habitats through landscape management. Good park management has lead to increase from 50 to 200 bird species, 25 to 50 butterfly species with even flourishing of jackal and blue bull. Conservation efforts are being carried in all forms through action research, education model, and awareness building. They also suggested that any new area for bio-diversity conservation efforts need brief profiling, area identification and legal acquisition. The acquisition of land for conservation is the toughest part and needs patience to navigate in legal and government machinery. Once acquired, land must be fenced and compartmentalized in small habitats. Stage wise restoration is better strategy even if land mass for conservation is huge. 1. There must be a feasibility analysis on connecting underpass between Aravalli Biodiversity Park, JNU and Sanjay Van. This underpass can provide corrugated landscape for migration of the animal within large areas. 2. The promotion campaign required for community awareness is bit missing. There is heavy emphasis on protecting biodiversity and securing ecosystem services. But, there is less emotional connect of the surrounding colonies (posh) except considering whole area as a jogger park. There must be introduction of concept like: Shinrin Yoku in the park. 3. The economic value of park in terms of reducing CO2 emission isn't used in spreading awareness. This park is an open facility without any fees to the visitors leading to financially unsustainable model. There must be concept of polluter's fee for conservation efforts. Thanks Note: Nature requires interpretor to understand the whole ecological balance. It was my honor to be educated on conservation, flora and fauna by Mr Shah & Ms Aisha. Hats off to team behind Aravalli Biodiversity Park for their passion and commitment. Enjoy a video that took 7 years in making ! The agriculture ministry on 22nd May released the Model Contract Farming Act, 2018. Mr. Ashok Dalwai, CEO, National Rainfed Area Authority has chaired the committee that drafted the model law. Contract Farming: Contract farming is a container concept that covers a wide range of contractual arrangements, which makes it difficult to draw overly general conclusions. Under contract farming, agricultural production (including livestock and poultry) can be carried out based on a forward agreement between buyers (such as food processing units and exporters), and producers (farmers or farmer organisations) frequently at predetermined prices. 1. In addition to contract farming, services contracts all along the value chain including pre-production, production and post-production have been included. 2. “Registering and Agreement Recording Committee” or an “Officer” for the purpose at district/block/ taluka level for online registration of sponsor and recording of agreement provided. 3. Contracted produce is to be covered under crop / livestock insurance in operation. 4. Contract framing to be outside the ambit of APMC Act 2003. 6. No rights, title ownership or possession to be transferred or alienated or vested in the contract farming sponsor etc. 7. FPO/FPC can be a contracting party if so authorized by the farmers. 1. As per Professor Sukhpal Singh of IIMAhmedabad: The new model Act 2018 opens up agricultural markets to contracting agencies without adequate safeguards for farmers. 3. Opinion Piece by Jayshree Sengupta, Senior Fellow (Associate) with ORF's Economy and Development Programme on making contract farming suitable for Indian farmers. 1. FPOs as aggregators: From the draft Model Act, it is not clear whether FPOs can also be contract farming sponsor. There may be a situation where FPOs would like to expand the cultivated area without increasing number of the farmers as members. The model law should clarify that how can FPO will be able to expand farming activities adhering to contract farming route. 2. Pro Farmer Policy: The Act lays special emphasis on protecting the interests of the farmers, considering them as weaker of the two parties entering into a contract and has been provided for reasonable protection to the weaker party to the contract, i.e., the producer, the pre-agreed price, category wise as under Section 18(2). Where no price premium exists, and a competitive price is paid on local markets, the intermediary role of FPOs may become more important for enabling higher income effects of the contract farming arrangement. 3. Capacity of State: The model contract farming Act proposes a state-level agency, the Contract Farming (Development and Facilitation) Authority, which would put contract farming outside the scope of the APMC. There is already acute shortage of extension services in Agriculture Department and current Act is proposing for an officer at the district/block/taluka level. 4. Corruption and Transaction Cost: More the responsibilities taken by the government staff, there is a higher chances of bribery for the online registration of sponsor and recording of agreement with a registering and agreement recording committee. Registration imposes extra procedure mechanism and costs on the parties, while small and marginal farmers cannot easily afford these transaction costs. Transaction costs embedded in contract farming need to be outweighed by the benefits, both for sponsoring corporates and farmer. 5. Monopoly, Fraud and& Settlement of disputes: Sponsoring agri business companies will exploit the monopoly position and similarly farmers will sell outside the contract (extra-contractual marketing) and divert inputs supplied on credit to other purposes, thereby reducing yields. There is no provision of budget for the establishment of body for dispute settlement mechanism at the lowest level possible required for quick disposal of disputes. 7. Price Discovery and Market: Normally, contract farming does not work in an ecosystem when either party is looking to fetch a better price without any product differentiation. This is where derivative market integration with farm sector can help. This will eventually lead to both party trying to get the best price from the market instead of the each other. Where there are fixed price contracts there is no apparent risk to farmers with regard to payment for their crops. If a market collapses, the sponsor should automatically shoulder the loss. However, if the sponsor becomes bankrupt, farmers could be permanently affected. Where contracts are on a flexible or spot-price basis the stability of farmers' incomes is always at risk. 8. Farm income varies between commodities: The costs associated with contracting is high hence, it tends to be limited to high-value commodities (including meat, milk, fish, fruits, vegetables, and cash crops) being grown for processors and exporters who sell into quality-sensitive markets. An apple grower benefit from higher yields (presumably due to technical assistance), while contract green onion growers receive higher prices (presumably due to better quality). 9. Establishment of Forum: A major feature for market to work is a "market matching" exercise. This can be done by organizing forums where agribusiness entrepreneurs could meet FPO/ farmers' representatives to discuss their requirements. The forums can be followed by more detailed discussions between individual sponsors and individual cooperatives or farmer organizations. 10. Literature Review: All studies report at least one case of contract farming that has a positive and statistical significant income effect. The lack of studies on ‘failed treatments’ leads to an overestimation of the effectiveness of contract farming. The practitioner-oriented literature indicated the high risk of failure in the first years and stressed the need for adaptive management and mechanisms to settle disputes. Apart from food security effects, the role of contract farming in rural development, such as (sector-wide) innovation, and livelihood resilience, will need more research. Conclusion: Modest expectations and careful planning are needed for contract farming to be effective and sustainable. However, it is important for policymakers to be realistic about the potential scope of contract farming. Thus, policymakers should not think of contract farming as a solution to the problems of credit, information, and market access for all small and marginal farmers . Model Contract Farming Act should be a promoting and facilitating Act as is intended, and should not end up as a over-regulating act distorting the market for both players. 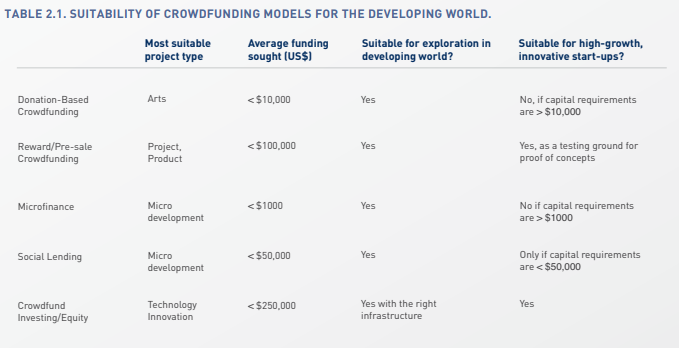 Crowd-funding is a relatively old practice commonly known as “friends and family financing.” The transparency and scalability of Web 2.0 technology has emerged as a social media-based funding mechanism leading to development of Peer to Peer platform. Crowdfund investing (CFI) is the investment alternative to pledge-based crowdfunding. This term, which describes securities based equity and debt fundraising through crowdfunding platforms, has recently emerged as an alternative to more traditional funding tools such as bank loans, angel or venture capital (VC) investments for financing entrepreneurs and small and medium-sized enterprises (SMEs). Debt crowdfunding is more popular and commonly known as peer-to-peer lending (P2P lending). It is the practice of matching borrowers and lenders through online platforms. This is an innovation in entrepreneurial finance that can fuel the Rise of the Rest globally. In the developed world, most platforms are donation and perks-based. The early success of platforms, such as Kickstarter, has brought annual growth in the number of platforms of 60% CAGR. PwC has presented an analysis on P2P lending Peer pressure: How P2P is transforming consumer lending industry. PwC paper discusses how peer-to-peer lending platforms are transforming the consumer lending industry and the key considerations that financial institutions should evaluate when deciding on their strategic response. Is P2P disruptive? I would say it certainly has been, but in the Indian context, it can make serious and material difference to the credit scene in the country. Access to finance is the most common constraint to growth cited by entrepreneurs in a broad range. Growth rates are higher for smaller enterprises yet the size of them becomes stagnant after a certain turnover. More recently, micro-finance has succeeded in expanding access to credit for the poor but high level of interest rates hinder the formation of surplus. By allowing customers to borrow smaller sums and lower interest rates than MFIs, the advent of P2P finance can open more possibilities for reaching the under-served than ever before. Currently the recommended rate of interest ranges from 12% p.a. to 28% p.a. and the loan tenure ranges from 6 months to 36 months. The Fintech revolution in India had also facilitated a sudden boom in Indian P2P lending industry. The Indian P2P lending space has players like LendBox, LenDenClub, IndiaMoneyMart, Monexo, Rupaiya Exchange, LoanBaba, CapZest, and i2iFunding. Until few years back, there was no regulation in place to regulate P2P Lending. Any entity could undertake the business of P2P Lending Platform without any restriction and accountability. RBI has shared master directions for NBFC–Peer to Peer Lending Platform in 2017 and updated as on February 23, 2018. The new regulatory era began when Faircent become the First and only RBI recognized P2P lending platform. India must find an appropriate balance between protecting investors and ensuring the flow of capital to early-stage companies. Modest and balanced regulatory schemes will more likely to accelerate formation of high growth MSMEs and crowd-funding ecosystems. The existing companies which are currently carrying on the business of P2P lending has been given 3 months’ time to apply for registration as an NBFC-P2P within 3 months from the date of the direction i.e. January 03, 2018. Recently, reports surfaced that digital payments giant Paytm is in the process of seeking a license from the RBI to operate a P2P lending platform. Most of the MSME owners don't have the assets to present a collateral and hence don't qualify for the traditional finance. The need for collateral, from lender perspective, arises because default rates in this segment are higher and are unfeasible for profitable lending. However, only a small portion of borrowers (entrepreneurs) default and majority of this group forms a genuine customer base. But unfortunately, today there is no mechanism to segregate good portfolio from the bad in MSMEs. Hence, the lenders mandate some form of collateral to manage the risk. To reach their complete potential, this systemic hindrance & risk management must be tackled by P2P platform. Investors will be needing standardized and efficiently delivered information about business plans, use of proceeds, valuation and other disclosures in order to make investment decisions. The future is bright but the customer protection measures in place: caps on investment size, repayment frequency, tenor, margins and lending rate can lead to a sustainable Business model. A recent study of more than 600,000 researchers, entertainers, politicians, and athletes found that high performers are 400 percent more productive than average ones. Steve Jobs summed up talent’s importance with this advice: “Go after the cream of the cream. A small team of A+ players can run circles around a giant team of B and C players.” But only big 4 Consulting firms and donor agencies have power over the candidate with good monetary compensation and brand value. The other organizations have to design better HR retention strategy as they don't have deep pockets. Being a leader at development organization is a tough task. There are essentially three basic ingredients that teams expect from a leader: Direction, Trust and Hope. Hence, building high impact team is tough as each individual require set of smart goals, timely feedback, progress monitoring, and supporting mechanism in the team. Yet, being a leader can lull one into a state of complacency. In that state one tend to assume that development consultants are subject to their will. One forget that a consultant can decide to leave them at any time. A leader can't retain development consultants alone on relationship basis. The company must support the leader with multiple levers (monetary, role, culture, growth, area of work) to manage and retain talent. 360 Degree Feedback: Development consulting firm must set a good example of managing candidate expectations by clearly defining and communicating the job role while also developing an exposure program for the new recruit. This must includes performance in probation period, annual salary increment, leave policy etc. Fairness in Appraisal: The most averted topic always come to haunt the enterprise during this phase. Fairness is the essence of justice. When the appraisal happen in a partisan manner and often whim of CEO, there will be disgruntled consultants. Intrapreneurship is the biggest opportunity for the managers, and can be instrumental in bringing big rewards. The monetary incentive to bring the business and client delight must be top priority for the development consultant. Such intrapreneurs must provide support the firm to start new ventures under the umbrella of the parent organization. Overburdening the development consultant with many consulting projects without offering a substantiate reward/ promise of the reward is a regular practice in development consultancy firms. This can't be brushed under the carpet as learning curve only. The burnout is a major reason to break away from the organization. Flexible hours: Development consultants want to have more flexibility in their working hours and remuneration packages than a pay increase. This can be introduced successfully in organizations by converting to the “total cost to company” concept and where the different generations and individual development consultants can choose to work less hours or condense their hours as well as how much of their remuneration packages is allocated to the various benefits and allowances made available by the organization. Work from home: While permitting flexible timings of work including permission to work from remote location must be encouraged. Encouraging development consultants to have a ‘work from home’ day at-least twice a week will be a great motivator. Many development consultants end up putting in additional effort on these days as well. Stock options:Equity in the organization is key factors in managing senior management talent. In other words, they create a sense of ownership in their development consultants who has shown loyalty and participated in the revenue of the firm. Volunteer Experience: Encouraging development consultants to work in other organizations for short term and get more hands-on experience for develop new skills/network can be used by the firm. Mentoring and career growth planning is important for middle and junior management. The insight into mentor's expertise by receiving critical feedback in key areas, such as communications, interpersonal relationships, client management, technical abilities, and leadership skills must be done in official manner. Gaining knowledge about your organization's culture and unspoken rules that can be critical for success and; therefore, adapting more quickly to your organization's culture. Access to Professional Network: Professional networking opportunities like conferences, mentoring, or even secondment to other parts of the organization, where they can get deeper insights into the work the organization does, and the difference it really makes. Networking with a more influential development consultants and donors always help in developing professional network of the consultant. Visibility: Everyone wants to work with a star performer. The drive of HR Manager must be for making a consultant into star performer. Fundamentally, opportunities and visibility creates a positive loop – visibility increase faster if one work on more opportunities; and one is picked for more opportunities if one has a higher visibility. The recognition of the peers is often greatest motivation factor in the ecosystem of organization. There is a British saying I always loved, “penny wise, pound foolish.” Organization spent more money in hiring new recruits rather than retaining in house talent. Retaining your good development consultant is such a valuable activity to focus on; it means spending less on employee turnover, reducing the chances of knowledge loss, and that keeps the morale of the team high. What is often overlooked when considering the retention strategies, is the habit of encouraging and listening to feedback from the exiting development consultants. They focus on retaining star consultant while they actually need a cadre of good consultants rather than solo star. Organizations always crib the fact that candidates lack the soft-skills to work in a development consultancy. But the not-for-profit sector isn't generally known for offering the structured training programs or even assigning a mentor that some big corporates provide. There will no perfectly finished development consultant to hire. There will be critical gaps in soft skills among candidates most of times, especially at the middle management and junior staff level. What must be non negotiable is good understanding of the sector with relevant technical skills. A Development Consultant’s primary role is to own and give technical advisory to the client projects and to facilitate research, in-depth analysis, and insightful problem solving. It is common for clients/consultancy firms to find social consultants through personal links and alumni networks, and while this may be effective, it is weak in terms of competition, transparency and accountability. The best way is to reach a range of potential consultants is to use free digital networks like Face-book Groups or LinkedIn or pay to advertise on job portals like NGOBOX. This improves the impartiality, build credibility of the recruitment process and creates chances of diversity in the organization. The sure way to build pipeline of talent is to build good relationships with one or two recruitment partners who can provide access to quality talent and help benchmark against the industry. Recruitment process must also include advertising the post though personal networks, asking colleagues for recommendations, or encouraging particular consultants to apply. Referral is the proof that the culture and profile of the organization has positively impacted life of employees. Getting referred candidates is an important part of the process and although this does not make it a more open procedure it provides an element of cross-checking. It is important to know if someone is recommending a consultant or just passing information to their contact details. The screening of the candidates can be done on the parameters given above in resume. Screening resumes usually involves filtering based on the role’s minimum and preferred qualifications. The biggest challenge of screening resumes by far is volume. Recruitment process must be designed in four stages. Even an organization will always put credence in analyzing track records and relevant experience, reviewing written reports, and talking to referees. But it is in the interview where chemistry is established and essential intangibles like passion, adaptability, and fit are determined. The trick is to hire mix of star and undervalued people and then give them proper leadership, guidance, environment and tools.Star will give you stellar performance for a short period of time (1-2 Years) while undervalued person will deliver tremendous loyalty and above average performance when given proper mentor-ship and supportive structures. Hiring undervalued consultant is not about promoting incompetence but same as buying good stocks at low worth. Whenever you question investment in hiring, always remember a great vision without great people is irrelevant. Good development consultants are expensive. As they say, If you pay peanuts, you get monkeys. This Blog is meant purely as a personal diary of a rural manager in making. It exists to record information, experiences and opinions about various issues encountered in the line of duty. Any person, institution and organization mentioned here doesn't assume any liability for its contents. This is not a deliberate attempt to defame anyone. And if you have actually read all that is written in the blog and aren't mad at me, then thanks for your time and patience ! Where do we Stand on Corruption? Maggi Crisis - Will Marketers Win Again? Rafale, France, Ambani – the true story! LabourNet changed my life with excellent training and a job opportunity. The Story of the 'Save'aa Kendra -Going the Extra Mile. Why Does Bernie Sanders Want Hillary Clinton To Immediately Release The Transcripts of Her Goldman Sachs Speech?